An article on what it takes to prove Darwinian evolution, authored by Doug Axe, and posted at The Stream. According to Darwin, evolution invents remarkable things like wings and eyes and brains bit by tiny bit — one little change at a time. That part of his idea might sound reasonable to us because we build things bit by bit as well. Essays are composed one letter at a time. Software code is written one instruction at a time. Buildings go up one brick at a time. But Darwin’s theory runs into trouble when we consider our own inventive activities more closely. Whether essays or software or buildings, we never start a project without having thought about the objective. We always have a plan in mind, and while this plan may be revised as we work, we’re always working toward something. These plans of ours enable us to evaluate our work all along the way. Are we making good progress? If the answer is yes — judged with respect to the plan — then we’re motivated to double or efforts in anticipation of seeing the fruit of our labors. In this way we invest in our creations — pouring into them with the hope of future benefit. Darwin’s blind evolutionary process has no way to do this. It has no ability to plan or to hope. Natural selection can’t labor in anticipation of future benefit. Instead, it goes with whatever works best now. The patience and foresight and insight we know to be absolutely essential for invention are completely absent from evolution. If things can’t be improved immediately, then they won’t be improved at all. We can dream up fanciful stories where amazing things happen though little Darwinian improvements, but the sober reality is that they are nothing more than that: fanciful stories. Charles Darwin, to his credit, recognized the problem long before we had discovered DNA and long before mathematicians had crunched the numbers. It’s the key problem he set out to solve. His solution: These biological novelties arose one tiny random variation at a time, with natural selection tending to seize and pass on the useful variations so that they accumulate over thousands and millions of generations until something as blingy as the eye could emerge. But Darwin’s solution comes at a price. The Darwinian pathway must proceed by a series of tiny, functional variations. Each new step needs to be functional. The Darwinian process can’t look ahead and say, “Hey, this variation doesn’t help Species G a bit right now. But when I get it put together with a few hundred or thousand other random variations, then it will give the little fellow a real boost, so I’m going to keep this presently useless variation on hand till then.” The Darwinian mechanism can’t look ahead like an intelligent agent can. It can only judge the present step in the process. This is where Nye runs into trouble. If I were to challenge him to come up with actual evidence for his evolutionary interpretation — a series of mutations that improves bird wing structure one tiny, beneficial step at a time — I’m pretty sure he’d come up empty handed, and not just for owl winglets, but for all the stunning inventions that characterize life. Indeed, the most strikingly consistent characteristic of the whole Darwinian evolutionary story is the complete lack of evidence that it could actually work. It’s worse than that, though. As I explain in my book, there’s plenty of counter-evidence — evidence that the clumsy cost-cutting effects of natural selection prevent even very modest acts of invention. As passionate as Nye is about science, then, why would he choose to ignore all this evidence? Now I have never seen a gradual genetic pathway from one body plan (phyla) to another body plan (phyla) in any peer-reviewed paper. 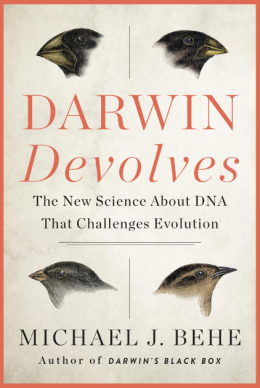 What I need to see to believe in the ability of Darwinian mechanisms to drive change from one body plan to another is that sequence of changes at the genetic level. And I don’t just need to see the steps, I need to see the probabilities of getting the correct sequence of changes at the genetic level within the time available by chance. That’s what Darwinists assert in their theory – that’s what they need to prove. Talking about how one creature looks like another creature is irrelevant. My winter car looks like my Dads car, because we drive the same model, but different model years – and both cars are designed by engineers. When people ask our side for evidence for our claims, we are able to produce the evidence to substantiate our claims, e.g. – cosmic fine-tuning factors or protein sequencing probabilities. I would like to see the other side do the same, and not just tell me a story. Axe needs to challenge Nye to a debate about this, and then we can find out whether there is any evidence for Darwinian evolution at all. I’m so glad you posted this excerpt. Years ago I talked with a Creation Scientist, and I referred to the Darwinian phrase “natural selection seizes and passes on useful variations” (my rewording). I asked how can natural selection (which is blind) know exactly what is useful? Knowing or recognizing what is useful implies a mind. And, why is “use” important? Survival? Doesn’t that imply teleology? We didn’t progess in that conversation, but it’s always been on my mind!